Speaking of fake news … who you callin a flying monkey? Several times lately I have seen cut and paste postings claiming that Barack Obama has been declared the worst president ever in polls. Where are these images getting the most traction? Why, the Kindergarten Konservative choir is the obvious object of affection. The go to words are “cut and paste” which has been the intention of those who created the graphics/images in the first place. This is a great example of what we all should be doing before we write, accuse, slam, slander – even criticize. It’s called homework; due diligence; honesty; investigating sources – all the things, for example, our Congress folks on their committees should be researching before they get on television, pop off and make fools of themselves. Every time I get called on writing something that I have not properly researched I realize I have it coming. For the above question of fake news and who is lying, I started a web search. I found the same results on several sites and will use Snopes’ report. 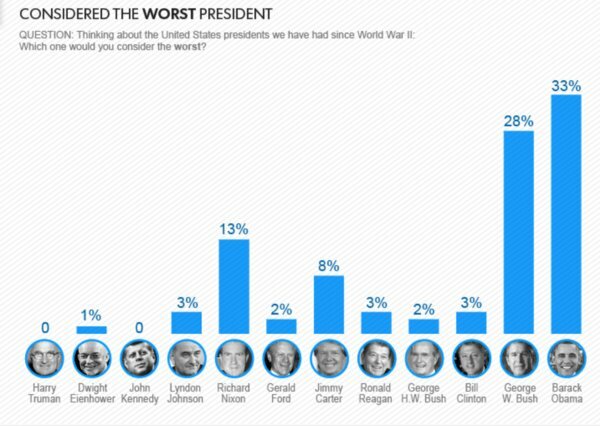 Was Obama Ranked ‘Worst President Since World War II’ in a New Poll? All I can say is that if you cut and paste blindly, with blind trust, blind faith and blind confidence, you’ll be nothing more than a flying monkey. This entry was posted in 'Tain't funny McGee, American Maturity, Critical Thinking, What's Up With Me Today by Arthur Ruger. Bookmark the permalink.